Atomic Floyd SuperDarts review | What Hi-Fi? With some premium products, it isn’t always apparent where your money’s going. With others, such as these SuperDarts, it’s obvious. From the lovely-looking injection-moulded steel enclosures to the Kevlar cord and smart three-button remote-and-mic unit, it’s clear Atomic Floyd places immense pride in its designs. 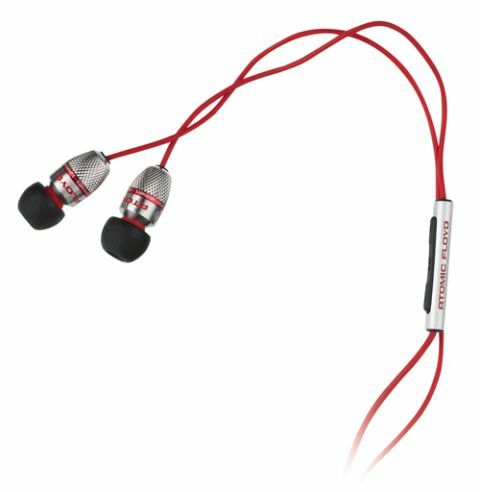 The bullet-shaped earphones look like they’ll stick out, Uhura-style, from your ears – but in fact they sit very snugly. We do have slight reservations about the way the cable comes out, though – repeated kinking under a hat, say, might eventually take its toll. We have no such reservations with the fit. The SuperDarts come with three sizes of silicone tips, so finding a good seal shouldn’t be a problem. You also get a 6.3mm adapter plug and a two-pronged flight adaptor in the box, and a rubber pouch to keep it all in. Plugged in and with a WAV of Brother Love’s Turn It Up! playing on our iPhone 4, the sound on offer is rather ‘scooped’. Picture an old-school ten-band graphic EQ: push all the sliders to the top, then take the middle six and push them down again. That’s how the SuperDarts sound. The low frequencies, while undoubtedly warm and very weighty, just don’t have the definition we’d like. Kick-drums don’t so much ‘thwack’ as ‘whump’, and as the music gets more complicated, the bass slows things down a little. The midrange, however, is nicely detailed. There just isn’t enough of it – it’s overwhelmed somewhat by all that bass, and you have to listen quite carefully to pick out fine vocal inflections. It’s a shame, because vocals sound nice and natural otherwise. But it’s the treble that we have the biggest issue with. It has an airy, open quality, sure – that’s all well and good – but with it comes a brittle edge that makes longer listening sessions quite tiring. That said, there’s reasonable detail on offer at the top of the frequency range. At £200 we expect a near-flawless balance across the entire frequency range, but the SuperDarts don’t deliver that. If big bass is your thing, and you like a lot of treble in your music, then by all means give them a whirl – but we can’t recommend them next to such stellar competition as the Shure SE425s and Klipsch Image X7i.